In Predator, Arnold Schwarzenegger is the leader of an elite squad of commandos on a mission to a remote region of a South American jungle. They are searching for South American officials who they believe have been kidnapped. What they find instead makes them realize they are facing a deadly and mysterious killer. This film also stars Jesse "The Body" Ventura, long before he became a governor. His character is great - a tobacco chewing tough guy who is bigger than Arnold (they use camera tricks to make this less obvious). He "ain't got time to bleed." 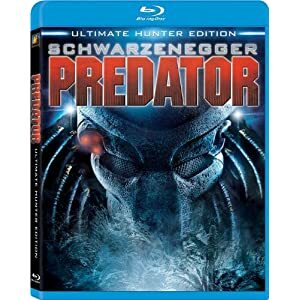 Predator is a great action film, and a wonderful addition to any movie-lover's collection. Buy it now.